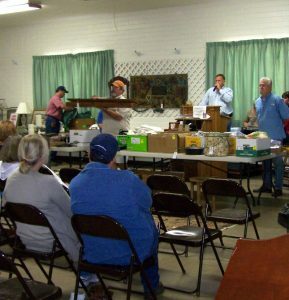 We haven't found anything good in a while, there are few spectacular big sales on the calendar, and our favorite thrift stores have been milked dry ... so last weekend we explored a new venue: an estate auction. We had seen auctions on history channel shows, and had the the impression that they were cut-throat and expensive propositions, wherein one could get easily carried away, or accidentally bid on an item by scratching your ear at an inopportune moment. Still, I don't know why we had never done this before; lack of time and opportunity, probably. 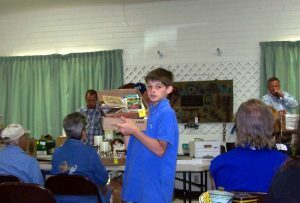 A friend of ours in Fredericksburg let us know of one, run by a local Fredericksburg auctioneer, on Saturday at the American Legion Hall. So, we toddled on up to Fredericksburg (again!) and checked out the Legion hall, which was about two-thirds filled with what was to be auctioned, including a one-horse buggy. How they got that inside, I will never know. There was an assortment of vintage furniture from the 1930s through 1970s, antique buckets and kerosene lamps, odd bits of this and that, a great many framed prints – good but not spectacular – china, woodworking tools, toys and craft-working supplies. We got there just as the bidding started. Maybe there were twenty or thirty people there at any one time; they seemed to float in and out. The first rule we agreed upon was no getting carried away in bidding: top limit was $15, and no bidding on anything we had not examined. She registered to get a bidder number; we made a list of interesting lot numbers, found some chairs and realized that this might be a very long day. 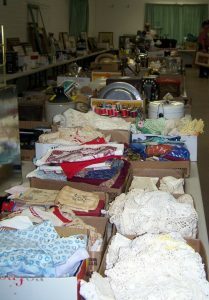 There were three ladies in front of us who were bidding enthusiastically; we assumed they were buying for an antique shop, as much of what they were getting were attractive and resalable things: framed prints, boxes of linens and doilies, a table lamp with a cut-glass base. But they bid on a number of boxes of Beanie Babies, too. The only thing that I was interested in was a lot with a group of ink drawings by a local Pleasanton artist; don't think they are originals, they look like prints, but there were several theater programs and special issues of magazines with them; an identical theater programs is on Amazon for $45, so we might be able to recoup the outlay by selling it. My daughter got flustered and transposed the number of one of our wanted lots, and accidentally put in a bid of $5 for a box of miscellaneous table linens and kitchen towels. The only time we went to our limit was for a box with some nice glassware in it which we had both looked at but wasn't on our list. This was my fault; I got carried away, as the antique-buying ladies bid on it too.